Slice the tops off the tomatoes and scoop out just a little of the pulp from the center of each one. 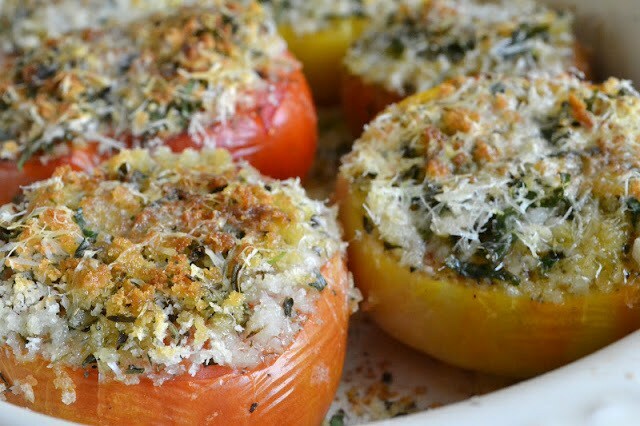 Arrange the tomatoes in an oven proof dish and sprinkle them with the salt, pepper, herbes de Provence, and lemon juice. In a small bowl mix together the bread crumbs, fresh herbs, garlic, and cheese. Sprinkle the mixture heavily over each tomato, filling the cavities. You can use any herbs you like, I used a combination of tarragon, basil, chives and thyme because that's what I had around. Drizzle the tomatoes liberally with olive oil. Bake for about 15 minutes, then put them under the broiler briefly to get browned. Serve while nice and hot.